I love it when, during our morning study time with the Lord, my husband challenges me to follow a trail through Scripture, unpacking a word from Jesus to reveal a bigger picture of our relationship with the Father. The other day, it all started with John 17:4 ... I glorified You on the earth, having accomplished the work which You gave Me to do. So, naturally, I was curious to know what the Bible defined as the exact nature of the work Jesus did, and what was God's objective in sending Him to do this work? What did God intend for Jesus to accomplish? These may seem like uncomplicated questions, and that every Christian should know the answers. But I didn't want to just accept Church doctrine -- I wanted to discover the full revelation of God's plan. And I discerned that it is really a two-fold answer. The word "work" in Greek is ergon, and it's definition is "to toil (as an effort or occupation); an act or deed; labor". While on earth, the accumulated deeds [Jesus did] were His work. 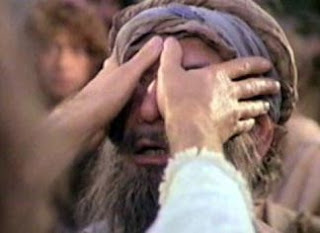 But the second aspect of His "work" is the accomplishment of the Father's purpose in the commandment to do those deeds. The glorification of God, the Father, comes from both the work (deeds) themselves, AND the accomplishment of the work. Make sense? The next step I took in unpacking the Word, was to go to John, Chapter 4, verses 32-34, where the disciples urge Jesus to eat after His discourse with the Samarian woman at the well. Jesus tells them, "I have food to eat that you do not know about ... My food is to do the will of Him who sent Me and to accomplish His work". In other words, He is saying that He has no need of physical food, but He is spiritually fed by doing the work of His Father; the work He has seen the Father do. Here again, we see the double purpose of 1) doing the work and 2) accomplishing it; seeing it completely done. But what is the work? Jesus says it is the will of the Father. But what does that mean; what is the will of God? Jesus tells us in John 6:39-40: This is the will of Him who sent Me, that of all that He has given Me I lose nothing, but raise it up on the last day. For this is the will of My Father, that everyone who beholds the Son and believes in Him will have eternal life, and I Myself will raise him up on the last day. So, here, we see "the will" of the Father -- what God has determined shall be done through Christ. In other words, it is God's will (His desire and choice) that the works Jesus does will result in belief that He is the Son of God; and because of that faith, Believers will receive the blessing that God wishes to bestow upon them, namely, eternal life (or salvation). But the Father is fully aware that mankind is not going to believe Jesus just because He says He is the Son of God. God has already sent so many prophets who foretold of Christ's Coming, and of the works He would do, and yet not even the religious leaders recognized Him. For centuries, the descendants of Abraham had been looking for the Messiah as described by Isaiah 35:4-6: that God would come with a vengeance to pay back all the ungodly and save His people; He would do mighty miracles of opening the eyes of the blind, unstopping the ears of the deaf, healing the lame and mute; and His teaching and preaching would bring living water to those who thirst for righteousness. And those are the very "works" that Jesus did during His ministry -- all to accomplish the will of His Father, that those who would believe in Him would receive eternal life. But there is an aspect of this Truth that we in the Modern Church miss. Oh, we get the part about salvation and eternal life. But we miss what Jesus did to get those in the First Century to accept Him as the Son of God and their Savior. We are so scared of Ephesians 2:9 that tells us that faith is by grace; a gift from God, and not of works, that we only preach the message of salvation. But that's not all that Jesus did! Yes, He preached and He taught, but His message was accompanied by the works that God commanded Him to do -- healing the sick and casting out demons was part of the Father's will! Jesus explicitly says that He only does the things that are pleasing to the Father (John 8:28-29); and that He only does what He sees the Father doing in Heaven (John 5:19-20). ALL OF IT -- casting out demons, healing the sick, and preaching that the Father wanted His will to be done, on earth as it is in His Heavenly Kingdom -- were what the works of Jesus was all about. And it was ALL the will of God for Jesus to accomplish. And guess what, it is what God wishes to be done by us, too! For the life of me, I do not know how you can interpret John 14:12 any other way! I assure you and most solemnly say to you, anyone who believes in Me [as Savior] will also do the things that I do; and he will do even greater things than these [in extent and outreach], because I am going to the Father. And I think the logical extension of Jesus's words is that He is going to the Father because His work is accomplished -- now it is our turn to carry on His work! Like I said, we preach the message of salvation, but we don't have the works that accompany the message [which are God's will for us to do]; therefore the message [by itself] doesn't hold enough weight to convince ungodly men to believe in Christ. They see nothing in our actions or attitudes that convinces them we serve a mighty God. The state of the world is evidence of that! But I can tell you that when you do what Jesus did, by the power that comes from the Father [just as it did to Him] and you lay hands on someone and they are healed; or you are able to cast out the demonic voices they are hearing in their heads and they have peace for the first time in years; or you help them to see [in the spirit] that Jesus was with them during a tragic time in their life -- then you are accomplishing the will of the Father. The Lost have the opportunity to know and believe in Jesus, and the previously Saved will get their theology rocked and their minds renewed; they can let go of their "sacred religious cows" that have not brought them the freedom Jesus and God desire for them. It is only when they see the full picture of ALL the works of Jesus that they "will be able to test and approve what God's will is--his good, pleasing and perfect will" that accomplishes His plan and purpose. In the final analysis, it became clear to me as I followed the bread crumbs through Scripture and landed on John 19:30. When Jesus, with His last breath, says, It is finished!, I believe He means His supernatural works, and His accomplishment of the Father's will and purpose. The Way to eternal life has been instituted. We have been shown by Jesus that His works are the same works the Father does, and the same works the Father wishes us to accomplish. These works are not done so that we may boast, but to draw men to the saving message of Jesus Christ. It is clear -- it is the Father's will that all be saved -- but we are missing a vital part of Jesus's work to accomplish that -- the work that is clearly God's will for us to do. Ephesians 5:15-17 "Therefore see that you walk carefully, not as the unwise, but as wise [sensible, intelligent, discerning people], making the very most of your time [on earth, recognizing and taking advantage of each opportunity and using it with wisdom and diligence], because the days are [filled with] evil. Therefore do not be foolish and thoughtless, but understand and firmly grasp what the will of the Lord is". A works message will always ring hollow to the church as they equate all works to a salvation designation. Until the church is willing to dive into crowns,inheritance and rewards and unpack the truth of what our inheritance actually is and what the purpose of it accomplishes then the church will flounder with a Kingdom and works message. My people perish for lack of knowledge!! The time to catch up is now. You are absolutely right! Crowns, inheritance, and rewards are an important part of our Christian experience, and nothing to run away from. I hope my Christian life affords me crowns to throw at my King's feet… and I will be happy to have earned them and to relinquish them.